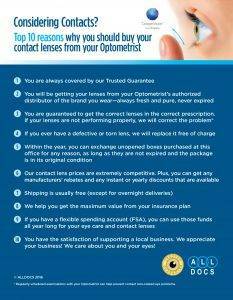 For those who use contact lenses there are a few precautions that should be taken when it comes to applying cosmetics. Below are some professional pointers on how to ensure you keep your eyes attractive and safe. Which Cosmetics Are Best for your Eyes? To start, we advise you use only cosmetics that are oil and fragrance free. Additionally, to prevent peeling or smearing, which could result in irritating your lenses, use water-resistant mascara and eyeliner. Lastly you should replace makeup used on your eyes frequently – ideally replace mascara monthly, liners after 3 months and eye shadows after half a year. Always make sure you rinse your hands thoroughly prior to inserting your lenses. Put on all eye makeup gently to avoid damaging your contacts. Try not to apply a brush or liner to the inner eye lid and start mascara from the center of the eyelashes as opposed to the bottom near the lid. Never share makeup with others or apply if your eyes are red or irritated. In addition to taking off cosmetics every day try to think ahead and avoid wearing contacts when you know you will be in contact with chemicals such as those used for treating hair or in a beauty salon. Being careful when using eye makeup when wearing contact lenses can avoid red, swollen or inflamed eyes as well as damage to lenses. When your eyes are red or infected avoid wearing any cosmetics around the eyes. Don't hesitate to call your optometrist if you experience any swelling, pain, or inflammation. Our Philadelphia, PA eye doctor will be glad to help you with any contact lens issues that are troubling you.